The Provincial Government and the Royal Ontario Museum (ROM), in association with Research Casting International, have completed the first phase of a joint venture to produce an exact replica of world-famous fossils at the Mistaken Point Ecological Reserve. A 70 m2 detailed mold covering of the fossil surfaces has been successfully created. Other partners in this project are the Johnson GeoCentre, Queen’s University and the University of Oxford. In collaboration with the Newfoundland and Labrador Departments of Environment and Conservation, and Natural Resources, the Nunatsiavut Government and the Institute for Environmental Monitoring and Research, the survey will be lead by biologists from the Government of Quebec in co-operation with the University of Laval. Burma Shave! (VII) — The Final Chapter? One hopes they will remember that there are only 741 days until the 2011 provincial general election, and who knows, maybe by-elections in Central Dannystan, too. 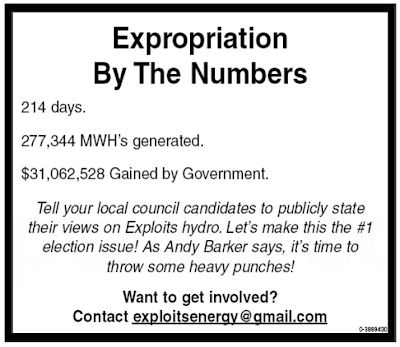 Pro-rating the Exploits Energy math, the provincial government by then will have "gained" over $107-million more, on top of the $33-million to date, from Our Dear Expropriation. Ahhh. Late September. Corn on the cob. Redberries. And openness and accountability. Yes, folks, it’s already Right to Know Week again. Break out the party hats. Bake cupcakes. And get ready to smash the living snot out of that piñata filled with five-dollar cheques made out to Receiver General for Canada and Newfoundland Exchequer Fund. Of course, it will be impossible to beat RtKW 2008, which was replete with birch rind, tar twine, cherry wine and turpentine, ticker tape, go-go dancers, fireworks, pie-eating competitions, doggie dancing and — OK, maybe none of that stuff actually happened, but at least RtKW was marked by a Minister of the Crown issuing a press release. The Honourable Jerome Kennedy, Minister of Justice and Attorney General, today acknowledged September 28 - October 3 as Right to Know Week in Newfoundland and Labrador. Right to Know Week is internationally recognized as a period to celebrate democracy, affirm the public’s right to access information held by government and acknowledge openness and transparency within the public sector. Unfortunately, certain other events last year cast a shadow of hilarious irony over the festivities. It is probably the potential for additional hilarious irony, stemming from certain recent developments, that has led the executive branch of government to defer to an officer of the Legislature to officially note the happy occasion this year. Happy Right to Know Week! The House of Assembly Accountability, Integrity and Administration Act, commonly referred to as “The Green Act”, was passed by the House as presented in the Green report in June 2007. This legislation implemented the compensation system proposed by Chief Justice Derek Green in his review of the workings of the House of Assembly. Chief Justice Green’s Report is available on the Provincial Government website at www.gov.nl.ca/publicat/greenreport/. Acting on Chief Justice Green’s recommendations, government passed the House of Assembly Accountability, Integrity and Administration Act. As in the case of any citizen, Members should be able to make a donation privately from personal funds to whomever they consider needs it. One has to be careful, however, to ensure that more wealthy Members should not be able to obtain an advantage in promoting their own political position by making substantial personal donations, thereby placing financial pressure on less well off Members to do the same. In my view, the effects of this potential inequity can be reduced by requiring that when a Member makes a personal donation he or she should do so without reference to the fact that he or she is a Member of the House; in other words, it is to be made in a personal capacity only. It is true that many people might nevertheless recognize the name and make the connection with the Member’s public position. There is little that can be done about that if the connection is made from general knowledge in the community. However, the Member should not actively promote dissemination of information about the connection when making the donation. Can anyone think of any of the "more wealthy Members" who make "substantial personal donations", oh, let's say, a significant portion of their salary as MHA, and are not shy about advertising the fact? Rob Antle goes in search of the latest on the New Dawn agreement, and ends up walking (and talking) in circles. There's the Danny Williams who professes to be thick-skinned, for whom criticism is, in his words, "like water rolling right off my back". And then there's the thin-skinned Danny Williams who protests, a little too loudly and often, that he is thick-skinned. One wonders, with totally spontaneous, not at all co-ordinated condemnation of The Cartoon, whether by pseudonymous shills on the intertubes, or non-anonymous ones on the airwaves, or P&P, which of the Danny Williams it was that Kevin Tobin depicted. Notice first the abrupt change in tone and body language when the softball butter-up question gives way, at about 1:20, to the subject of the Lower Churchill. Notice the further change at around 4:20, when reporters turn their attention to Our Dear Battle With Our Own Dear Information Commissioner (The Traitor). Radio host No Names Please suggests this afternoon, "We don't want one-sidedness in our federal politics." How can you tell when someone is punching ODP close to the kidneys? And then you get this narrow-minded, simple-minded comment. ... Basically Lorraine Michael comes out and says you can't spend that kind of money. If Lorraine Michael was running this province, God help us. That's all I can say. Remember, folks, this is coming out of the same condescending, hypocritical mouth that decries “personal attacks” – at least when the person being “attacked” is Himself. Cameron Campbell and MUNSU should take a page out of Our Dear Premier's playbook. 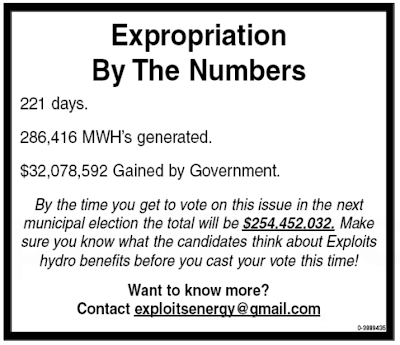 Just spin financial incompetence such as this as an "investment", and you'll be at 80% in the CRA polls, forever. “Shutdown” is a noun. “Shut down” is the phrasal verb. Kruger is planning a shutdown. Kruger is planning to shut down. “Stopover” is a noun. “Stop over” is the phrasal verb. Gadhafi is planning a stopover. Gadhafi is planning to stop over. Shannie Duff should get her math right. She’s called Keith Coombs out! - The opening line of a radio ad written and paid for by the Keith Coombs St. John's municipal election campaign. The long-term prospects may be good, but one group of tradespeople are having a tough time waiting out the jobs of the future. International Brotherhood of Electrical Workers,Local 2330, has about a thousand members in this province, but president Ann Geehan, says only about 130 of them are working. She says some of these 130 workers are employed on projects throughout the province, while others are working in western Canada. Geehan says while the prospects look good for the future, she says it's tough finding work for its members at this time. She is optimistic there will be lots of work in the coming months in Labrador West, which has always been their biggest employer; and also in Long Harbour, the Hebron development; and hopefully the Lower Churchill project. Geehan says it's tough on its members waiting around to find work. As we move forward to forge new and stronger relationships for the century to come, it is essential that the concerns and aspirations of all members of the federation be taken into account. Unfortunately, Newfoundland and Labrador is not convinced that the current Federal administration, having ignored our best interests when developing domestic policy, will do any better in representing our best interests when developing foreign policy. It's a good thing Our new determination to represent Ourselves internationally is restricted to trade policy, and not matters like international security, terrorism, and human rights. Otherwise, Dave Denine, as ostensible Minister of Inter-something, would have to join Lawrence Cannon on the tarmac at Torbay, registering Our official reprimand to the petrodictator of Libya. Those go-getters, the self-employed and small businesses, must be driving all that employment growth. Right? 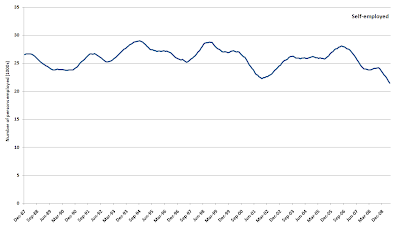 The following two graphs show the twelve-month trailing average of the number of people who are self-employed in the province (data in thousands). 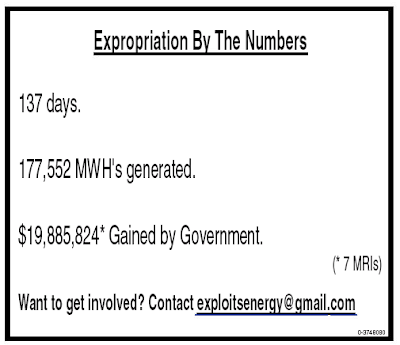 For example, the figure displayed for May 2009 is the average of the twelve months up to and including May 2009. This smooths out the seasonality in the self-employment figure, allowing for a long-term, apples-to-apples comparison. In the twelve months ending in May 2009, an average of 21,400 people were self-employed in all industries. That is off the recent high of over 28,000, recorded in July 2006. That recent peak was comparable to previous peaks, which were recorded in 1994 and 1998. 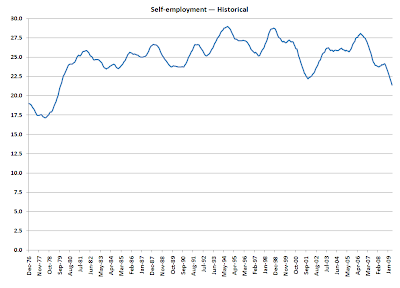 Taking a longer view, the May 2009 drop brings the number of self-employed down to numeric levels not seen since the late 1970s. Similarly, the importance of the small employer in the labour market has been stagnant or in decline for the second half of this decade. Employees who worked in enterprises of fewer than 50 employees account for less than a third of the overall employed labour force. From a modest peak of 34% in 2004, the trendline has slumped steadily downwards to 32% in the first quarter of 2009. 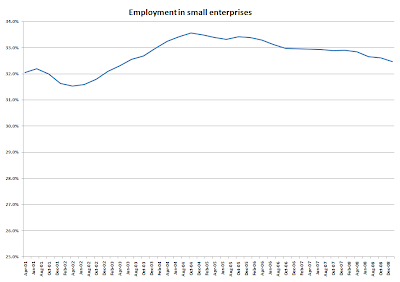 This chart shows the percentage of the employed workforce who work in such small enterprises, as a trailing average of the previous four quarters. Note that the vertical scale is exaggerated in this chart, which does not have a vertical baseline of zero. On September 24, 2009, Mr. Taylor resigned from the Cabinet and announced that he will be resigning as MHA on October 2, 2009. The Ministry of Truth is a little slower to catch up on current events. Triv is out of cabinet, and come Friday, October 9*, will be out of the Bow-Wow Parliament altogether. As per amendments brought in by Danny Williams-Government, who dramatically shortened the maximum duration of a vacancy in the House from three months to, well, two months, the by-election in Straits and White Bay North must be called on or before December 8, 2009. Another “piece” of DW-G’s electoral reform was the shortening of the by-election campaign period. The minimum of 21 “clear days” is still in place, but Bill 40 in 2004 also instituted a maximum of 30 “clear days”. “Clear days” means the number of days between, but not including, the calling and holding of the by-election. If the by-election were called today, it could be held on any date between October 23rd and 31st inclusive, although the only traditional Tuesday polling date available would be the 27th. If Hizonner in Council waits as long as possible to call the by-election (December 8), and goes for the maximum campaign (30 “clear days”), the by-election could be held, at the latest, on January 8, 2010. If the by-election is not to impinge on the Christmas period, it will have to be called much sooner rather than much later, and sooner still if the new MHA is to take his or her seat in time for the abbreviated fall sitting. The fall series, of late, has been starting in late November, and ending in early December. And then there’s that one, final wrinkle in the package of electoral reforms brought in by DW-G. In 2007, the Elections Act was amended by changing the provisions around special ballots. As per s. 86 (4), an elector can apply for a special ballot “not more than four weeks” before the election or by-election is even called. Good burghers of the Petit Nord, contact Elections Dannystan and vote today! PS: the electoral district of Straits and White Bay North includes a lovely rural community called Flowers Cove. * The dates in this posting have been re-calculated on the basis of Triv's end date as MHA: October 9th, not the 2nd as originally reported. There's nothing official yet but word is Libyan leader Muammar al-Gaddafi may make a stop in the province. The Libyan Embassy in Ottawa tells VOCM News there are preliminary talks about the leader possibly visiting Newfoundland and Labrador but nothing is confirmed on when or why he would be coming. ... and Golf Architect. Who knew? When spring is in the air and you are getting a fever for the fairways, one course that always comes to mind is The Willows at Holyrood. Opening its doors in the spring of 1997 to the public, the Danny Williams and Robert Walsh designed course has been noted as being one of the province's most scenic nine holes, as well as the province's toughest nine holes. The last time Himself was mentioned in a daily newspaper in connection with golf, it was in a special by Ian Cruickshank in the Toronto Star. The travel writer had the good fortune to just happen to run into the Duffer in Chief Himself, while the Toronto Star had the good sense to disclose that "[Mr. Cruickshank's] trip was subsidized by Golf Newfoundland & Labrador." In 2005, out of 197,185 households in Newfoundland and Labrador, 9,690, or 5%, had total household incomes of less than $10,000. Another 12,470, just over 6%, had household incomes that year of between $10,000 and $14,999. Source: Statistics Canada, 2006 Census of Population, Statistics Canada catalogue no. 97-563-XCB2006045. Number of times this effort at turd-polishing contains the phrase "Williams Governmment": 0. Number of times it contains the phrase "on a go forward basis": 2. The income statistics in the first posting in this series included people with no income, as well as people whose principal or only source of income maybe transfers to persons, such as social assistance or old age security. What about the working stiff? In 2005, 32,575 of the 175,425 members of the employed labour force, age 15 and over, had total employment incomes of less than $10,000. Again considering just the "working age" population between 25 and 64 years of age, 19% had total employment incomes of less than $10,000. There was a marked gender imbalance, with 23% of women falling into that bracket, compared to 14% of men. Source: Statistics Canada, 2006 Census of Population, Statistics Canada catalogue no. 97-561-XCB2006014. Richie Cunningham had more than seventeen "essentials" and he won. It was probably the angle parking that done it. Memorial University’s Presidential Search Committee held its fourth meeting Saturday attended by the full 12-person committee, as well as support staff and two consultants from Janet Wright and Associates, the executive search firm contracted by the university to assist in the initiative. The committee and consultants plan to continue efforts in the coming months with a view to concluding a successful search by early 2010. Really, now, what's the rush? 2010 will be only the third calendar year after Dr. Axel Meisen left the post in December, 2007. What the Premier is NOT aware of: the large, automatic raise he got three months ago. According to the 2006 census, there were 86,130 individuals in Newfoundland and Labrador, 15 years of age or older, whose personal income in 2005, from all sources, was less than $7,000. That's 20% of the population. Another 20,740, or 7%, had income in 2005 of between $7,000 and $9,999. Admittedly, many youth and PSE students are included in that cohort, and their low incomes will skew the results downward. Conversely, the guaranteed incomes from public sources for seniors 65 and older mean there are fewer seniors, in percentage terms, in the lowest income brackets than there are in the population as a whole. Looking then at just the working-age population between 25 and 64, 14% of individuals, in 2005, had an annual income of less than $7,000. Another 6% had incomes higher $7000 or higher, but less than $10,000. Working-age individuals who earned less than $10,000 accounted for nearly 60,000 of the just under 300,000 people in those age brackets. Individuals earning $80,000 or more that year accounted for 3% of the general population age 15 and over, and just over 4% of the working-age population. Source: Statistics Canada, 2006 Census of Population, Statistics Canada catalogue no. 97-563-XCB2006005. Last week, ODP’s comms shop gave the good folks of St. Anthony a one hour and forty minutes’, same-day notice of a Premier-positive event in their burgh. On Monday, the same comms people gave Corner Brookers (Corner Brookians? Corner Brookites? Angulirivulans?) a bit over four hours’, same-day notice of a Premier-positive event in their neck of the Bay of Islands. The reasonably close match between the duration of the same-day heads-up, and the driving time, at 90 km/h, from Flowers Cove to the sites of the Premierlicious events in western Newfoundland, is entirely coincidental. Premier Danny Williams says he takes full responsibility for retaining an advertising firm to stoke the province's pride in the Atlantic Accord deal without publicly tendering the contract. The premier was reacting to questions posed during a break between cabinet and caucus meetings held in Corner Brook Friday relating to the hiring of M5 Marketing Communications to a reported tune of nearly $200,000. Opposition Leader Roger Grimes criticized the premier for hiring a Conservative party-friendly firm and said the ad was nothing more than political propaganda. "Premier Williams continuously criticized me for advertising campaigns while I was premier," Grimes said. "He stated that he would never undertake political advertising campaigns with taxpayer dollars." The advertising firm chosen for the Accord work does have Conservative ties - its vice-president was co-chair of the Tories' 2003 election campaign. The premier reiterated the ads were not designed to pat his government on the back and called the tendering issue "a minor breach." "Anybody who tries to paint this as an opportune ad campaign misses the point completely," he said. "What's done is done. All I can say is anything done was done innocently and inadvertently, quite honestly." Premier Danny Williams is defending a decision to spend thousands of taxpayers dollars on an advertising campaign against Prime Minister Stephen Harper and the federal Conservatives. "This is an ad that supports our position for having been wronged by the Government of Canada," Williams said Wednesday. The province paid roughly $250,000 to publish full- and half-page advertisements in 16 major newspapers across Canada Wednesday. Among the publications were The Globe and Mail, the National Post and The Telegram. The Conservative government is spending more than five times as many taxpayer dollars on promoting its economic plan than it is on raising public awareness about the swine flu pandemic. That is again raising a long-standing question: when does government advertising cross the line into partisan boosterism? Television viewers may have noticed the latest feel-good government ads about stimulus spending, including the Conservative-friendly, anti-election pitch: "We can't stop now," and "We have to stay on track." All the ads direct viewers to a Tory-blue government website that includes more than 40 different photos of Prime Minister Stephen Harper and refers repeatedly to "the Harper government" — apparently in direct contravention of Treasury Board communications policy. What about at some other time? I would like to reassure the general public that government is not considering the other cost saving options at this time. It isn't terribly reassuring to end the sentence with the phrase, "at this time". MR. ORAM: Mr. Speaker, we were very upfront in telling people that we are now doing an assessment of all X-ray and labs throughout the Province. As we know, the Cameron report was very, very clear in its recommendations that we had to look at laboratory services. I can tell you now that we are assessing every particular site in Newfoundland and Labrador. The assessment is not complete yet but when it is complete we will certainly be back, and we will certainly be making announcements as they become available. MR. ORAM: Mr. Speaker, this is an ongoing process. We are looking and assessing all laboratory and X-ray services throughout Newfoundland and Labrador. We will be talking to physicians. We will talk to whoever we need to talk to, to gain information as to what needs to be done in terms of looking at the way that we deal with X-ray services and lab services in Newfoundland and Labrador. The fact, however, remains, Mr. Speaker. That if you look at the Cameron report and you look at recommendations such as number fourteen and number sixteen, you will see very clearly that the Cameron report talks about laboratory services and how we have to look at ways to enhance and change the way we are doing laboratory work, and laboratory work and diagnostic imaging usually go together. So we have to look at both of those particular services as we go through the Province and look at it. This assessment is ongoing and we will continue to assess it. In fact, the assessment of any type of service within health care is an ongoing process that continues forever, I say, Mr. Speaker. So we will continue to assess the services and make a decision based on that. We have made no decisions as to where we are going to be going next. We have said very clearly we are doing a complete assessment of all laboratory and X-ray services throughout this Province. We will continue to do that. When the time is right, when we see fit, and when we see that there is a savings or we see that there is a quality of service that can be enhanced, then we will make that announcement at that point in time. We will not be making announcements in the House of Assembly, Mr. Speaker, just based on a whim. Out on the west coast of the nation, the Premier cuts a ribbon. Meanwhile, far away on the east coast of the nation, the nominal health minister cuts his intestines out. This what you signed up for, Paul? Communism is dead; Marxism is dead; and no one has informed Mr. Cadigan. To write a history of Newfoundland and Labrador from a neo-Marxist perspective is not only anachronistic, it is simply wrong and invalid. It curves the truth and denigrates the struggle of all newcomers and settlers - from Day 1. It denies the individuality and fierce independence of the men and women who struck out on their own in this virgin place - answering to no one but themselves. Newfoundlanders have never thought of themselves as scapegoats. They are survivors, workers, toilers, forever building a better life for themselves and theirs. It is deeply discourteous and offensive to call Premier Danny Williams a tycoon. Stating that is to cast him in with all the previous fraudsters, hucksters, gangsters and impostors that have plagued, pillaged and plundered our beloved Newfoundland and Newfoundlanders. On the contrary, Mr. Williams is an entrepreneur. He is a highly intelligent, compassionate human being who cares passionately about Newfoundland and Labrador, its people and the future for all. The reviewer repeatedly favours the collective ("Newfoundlanders", "they"). And she is deeply mistrustful of capital and capitalists ("fraudsters, hucksters, gangsters and impostors that have plagued, pillaged and plundered..."), except, of course, for the Father of the Motherland, Mr. Williams. But Sean T. Cadigan is the Marxist? Day by day and almost minute by minute the past was brought up to date. In this way every prediction made by the Party could be shown by documentary evidence to have been correct, nor was any item of news, or any expression of opinion, which conflicted with the needs of the moment, ever allowed to remain on record. All history was a palimpsest, scraped clean and reinscribed exactly as often as was necessary. Newfoundland Premier Danny Williams said he had come to pay tribute to Mulroney, for whom he did some work in the 1980s. "He enabled us to be in a very, very strong financial position that we’re in now," Williams said. "If I did not have an Atlantic Accord to work with when I became premier, it might not have enabled me to do the things we’re doing in Newfoundland and Labrador." This would of course be the same 1985 Atlantic Accord, one presumes, that in the past — say, up to and including last Wednesday — would have been included in the Established Catechism of Giveaways. Cf. 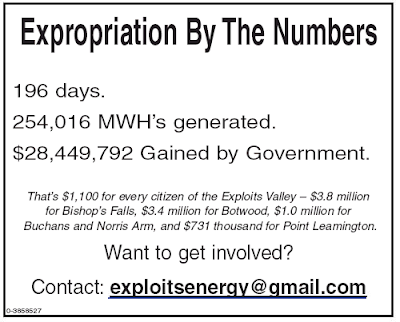 the mutable theological position of the Voisey's Bay project, which, along with the "giveaways" on the offshore projects which are actually producing oil and royalties, are enabling Us to do the things We're doing since We became Premier. from away not by choice from que writes: AMEN couldn't some of these HQs for NL crown companies move off the avalon? now that would make a good election platform- but then again the political machine being what it is would shut down that idea. It does parallel the fed gov't centralization of jobs & ministries in Ottawa/Gatineau. Parallel? Nothing could be further from the truth. About 40% of the federal civil service work in the "National Capital Region" of Ottawa-Gatineau. That is substantially lower than the 70% or so of the provincial civil service whose jobs are in the St. John's metropolitan area. On Thursday, the Members’ Compensation Review Committee held the last of its "public meetings" in St. John's. Meanwhile, the Secretariat for the Joint Panel appointed to review the proposed Lower Churchill Hydroelectric Generation Project is holding a third round of public information sessions, in Labrador, Quebec, and Newfoundland, beginning in North West River on Monday. The Lower Churchill Panel's public information sessions have been, and will be, held in the evening, after working hours, with most of them running from 7:00 to 9:30. The Members’ Compensation Review Committee held its "public meetings" from 2:00 to 5:00 in the afternoon. Mitigating factor: at least they were held from 2:00 to 5:00 in the afternoon. 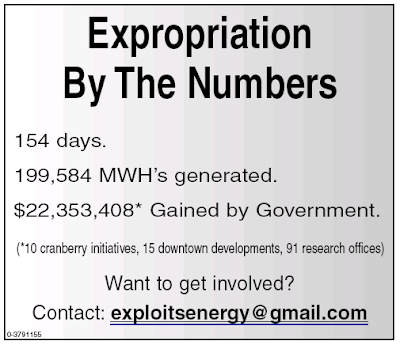 The mid-week installation from Exploits Energy. Letters in and emails sent. — I used to think that way. So I’ll obstruct them, every one. That FOI’s a nuisance overall. I really don’t like FOI at all. I look at it that way. And can the pessimistic crap. Why can’t you go away? It just annoys me overall. They just want dirt to use on Us. Well no sir, not today. My promises I don’t recall. All this talk of million-dollar cost overruns on capital projects put on the books just a few years ago, like school and recreational facilities in St. Anthony, or health-care facilities in Lewisporte, is starting to get disquieting. At the same time, it certainly is reassuring that there are no similar reports about hundreds of millions of additional construction costs, compared to earlier estimates, on other, even bigger-ticket projects, like the Hebron oil development or the so-called Lower Churchill. Yet another lesson in how not to be open and accountable. On September 11th, Jerome! tabled the annual Report on Program Expenditures and Revenues of the Consolidated Revenue Fund - 2008-09. The document clocks in at a dialup-clogging thirteen megs and change. Go ahead. Download it (link) — if you really want to. Because, apart from the cover, the rest of the document consists of scans of a paper document. It's almost as if the original publication was composed with moveable type and hot lead, or wax, or something. It's almost as if it wasn't originally prepared on commercial software, which would lend itself to instant and easy conversion into a textual PDF, instead of a graphic one. You end up with a bloated, multi-meg file, instead of a document which would likely be no more than a few hundred K, and easily accessible even to rural internet customers. In addition, by scanning the document as images, and creating a PDF from those images, instead of generating one from its native format, the resulting PDF "text" can neither be searched nor clipped and pasted. They should have asked a computer guru how to do things right, from a computer perspective, on a go-forward basis. Of course, this effective defeat of the convenience and utility of modern technology, which might make it possible for members of the public to share information about the state of the provincial finances, is almost certainly not deliberate on the part of government. Not that kind of fluids lab. That's $500,000 worth of Provincial money that former Health Minister Ross Wiseman is doling out to a private company in St. John's. Non-repayable. And astonishingly, We aren't even getting an equity share for all that trouble. 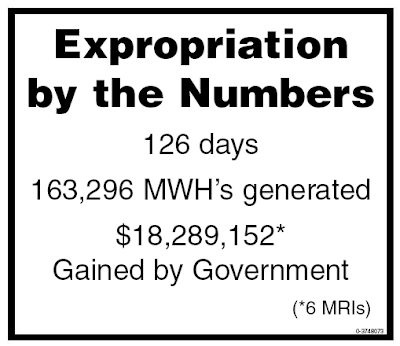 That amount, incidentally, is enough to pay for two and a quarter years worth of the public x-ray and laboratory services that current Health Minister Paul Oral is cutting in Lewisporte. "Quite frankly, I'm appalled that someone would even make that comparison," he said. "We're talking about two separate issues altogether. What we released Friday was essentially information trying to reassure people that what I had said in the house of assembly was correct information. I was asked to release that information. I got the information together. I didn't want to sit on it. I wanted to get it out right away." Oram said he didn't speak with the media last Friday because it wasn't necessary. "It wasn't that I wasn't available," he told CBC News Monday. "I didn't see any point in commenting. I thought it was very, very self-explanatory that this is exactly what we had said, and what I had said, in the house of assembly." The premier and his underlings should start planning to use the so-called “Anglo-Saxon route” and forget begging Quebec to become involved. This project has been bandied about for decades and now is — as the premier says — time to get off the pot. The Lower Churchill should be a jewel in the energy crown of this province contributing billions to our treasury and economy. There has been enough planning and whining. Get the financing in order and get the shovels digging. Genius! The editorialist should run for elected office! Just go with the "Anglo-Saxon" route and get the financing in place. Devastatingly simple! No one, not even Danny, has ever thought of doing this until now? Whether you like him or not (and clearly a great many do), Williams must be given credit for approaching the larger economic and natural resource files with a level of intelligence and determination not before seen in this province. In those areas where he has been less effective – in dealing for example with the continuing faltering fishery and the great exodus from rural Newfoundland – the greater blame must be borne by an indifferent, condescending and inept national government. That has not stopped the Quebec-owned, anaemic, shallow and overtly biased Telegram-of-today from pursuing a single-minded crusade against Williams and his government. I can sympathize with government’s dilemma – the more access they provide, the more they help the Telegram and its anti-Newfoundland ownership exploit that information in a manner that not only weakens Williams politically but undermines the Province’s stand on any number of economic issues (i.e. the running battles with Hydro-Quebec on Labrador power and Quebec-based Abitibi on the recall of natural resources). Fintip would seem to have some deep-rooted issues with Quebec, including the fact that the Telegram’s parent company, Transcontinental, is a Canadian media company (and a pretty good one) based in Montreal. That brings to mind a word which starts with “x” and rhymes with Jennophobia. We know that if you come in here as an equity player that you have to have a good return on your investment. And we want you to have a good return on your investment. But it also has to be a good deal for the people of Newfoundland and Labrador. Now we have been with that message back and forth [i.e. 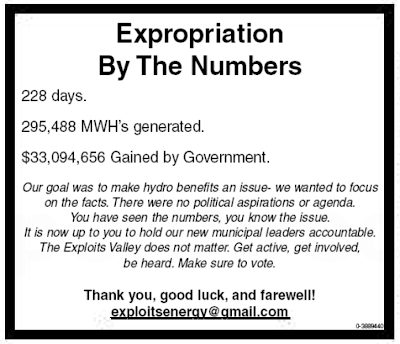 to Hydro-Quebec] for five years. No, sir. No, sir. There is no takeup on that proposal. Quebec-based companies. Nefarious things, when they merely own newspapers. What on earth would fintip think if Williams were on bended knee, all but begging a Quebec-based company, a Crown corporation, no less, to take an ownership position in Our Dear Lower Churchill? For fintip’s own health, don’t let him (her, it, them) know that Kathy Dunderdale and Danny Williams are actively trying to undermine the position of Williams. Isn’t it terrible when one of our own betrays us like that? So, after four o'clock on a Friday afternoon, the Department of Health and Community Services drops this spectacular nugget of poop. In a move much like one criticised by government a few months ago, the province has released information in a late Friday afternoon news release without making anyone available for comment. Health Minister Paul Oram, who has been taking the brunt of criticism for cutting lab and x-ray services in Lewisporte, and Flower's Cove, is shifting the burden on Central Health. After the letters were released late Friday afternoon, a Health Department spokesperson told CBC news the health minister has no further comment at this time. There are six paragraphs, and a misleading headline, which reads, "Province assessing laboratory and X-ray services." It gives no indication that services will be curtailed for anyone. Now, for the love of Danny, put down the gun. No one should be shot. Certainly not for releasing health care related documents in a press release issued after four o'clock DannyStandard Time on a Friday afternoon. The LC isn't an energy project or a business project: it's a re-election prop, first for Tobin and now for Williams. Mr. Smallwood said the Churchill project would be only the beginning of power development in Labrador. There is another 3,000,000 horsepower elsewhere on the Churchill River and millions more on other Labrador waterways. [Premier Frank Moores] said many industries are likely to want to establish in Newfoundland when power from the Lower Churchill River in Labrador becomes available on the island. Some “trigger industries” would be needed to make the Lower Churchill project feasible, especially in light of the cost of transmitting power to the island from Labrador by undersea cable across the Strait of Belle Isle, a distance of between 10 and 15 miles. None of the power from the Lower Churchill, which has a potential of three million horsepower, would be sold outside the province. Quebec and Newfoundland are making real progress in resolving their dispute over development of hydro power from the Upper Churchill River in Labrador, Premier Brian Peckford said yesterday. At a news conference after meeting with Prime Minister Brian Mulroney, Peckford said his government has met four times with the government of Quebec Premier Robert Bourassa about hydro power from Labrador, and another meeting is scheduled this fall. "We are not just talking concepts - we are down to specifics on how to solve the impasse between us," Peckford said. "We've actually put some things on the table and they have responded and are looking at it," he said. "So we are making some progress. But it's a big deal and it's going to take some time. It'll take a year for sure." Negotiations with Quebec on a $10-billion deal to develop Labrador's power potential are coming down to the wire, Newfoundland Premier Clyde Wells said Tuesday. “We're probably getting near the end... where we're going to have a decision pretty soon,” Wells told the Newfoundland Ocean Industries Association in a luncheon speech. Wells said there are “a couple of key areas” that remain unsettled in talks between the two provinces on a deal to build two new hydroelectric plants on the Lower Churchill River. “I cannot give you an indication today as to whether or not we will reach agreement on that,” he said. The latest round of talks on the new stations began about two years ago. “They have progressed in detail to a far, far greater extent than ever they did at any time over the last 15 or 20 years when similar discussions have taken place,” said Wells. What ever happened to that nice Mr. Ottenheimer? Newfoundland Tories want the provincial government to suspend talks with Quebec over hydroelectric development of the Churchill River. The party, during its annual convention Saturday, said development shouldn't proceed until an agreement is reached on a transmission line that would bring cheaper power to Newfoundland from Labrador. "It's important that we ensure that the people of this province are protected," said Tory energy critic John Ottenheimer. "What better way than to ensure that we can have cheap and efficient transmission of power and resources from Labrador to the island." And see how incredibly un-difficult and not at all expensive it is to do so in electronic format? Provincial cabinet minister, forced by ethics rules to choose between his political and his personal interests, chooses personal ones. The provincial ethics rules rule. At least in that particular province. Makes a body wonder whether there might not be merit in this modest proposal. The Transparency and Accountability Act will greatly enhance openness and accountability in government, but a comprehensive and effective Freedom of Information Act is the best safeguard against the tendency of governments to descend into official secrecy and elitism. If we had to disclose everything that went on in cabinet, then from a Lower Churchill perspective or Hydro Quebec's perspective or anybody who's competitive in that market, they would have access to all our information and we wouldn't be able to sit down and negotiate anything. One little scrum, so much news. It’s like the Energizer Bunny of scrums. It just keeps going and going and going. Q: Would Wade Verge maybe have gotten his information correct if he had briefing notes on what was actually going on in his constituency concerning the removal of x-ray and lab work? Williams: Wade Verge was told by my Chief of Staff, he was told by Minister Wiseman, when he was Minister of Health, and he was told by Minister Oram as Minister of Health. Can’t do any more than that for Wade Verge. 1) Wade Verge: you thought Danny, your leader, was done insulting your intelligence with his “pfff”? Well, he wasn’t. 2) Ross Wiseman’s last full day on the job as Minister of Health – a capacity in which, with or without notes, he apparently briefed Wade Verge on the impending cuts to diagnostic services in Lewisporte – was July 8th. Back to you, Wade, Ross, and Paul. Gee — maybe someone should have kept notes? For weeks and months in the second half of 2002, the newly-minted Leader of the Opposition hammered away at a single theme. "Seeking some way to redress the unfair balance of benefits from the Upper Churchill development has, until now, been a part of what Newfoundland and Labrador expected to get from Quebec in any further development of the Churchill River system. "It looks very much like the Grimes government has given up on that objective and is prepared to proceed with the development of Gull Island as a stand-alone project without any attempt to seek a way for Newfoundland and Labrador to get a fairer share of the benefits from the Upper Churchill." Williams said the province would be better off developing the project through the Lower Churchill Development Corp., which was formed by the federal and provincial governments several years ago and held exclusive rights to proceed with further Churchill River hydro developments, rather than the province dealing exclusively with Hydro-Quebec again. Mr. Speaker, by 2010 the Government of Quebec is forecasting a shortage of power that will leave them unable to meet their commercial obligations. Cheap power is the foundation of their energy plan and their key to economic development. One would think, therefore, that Quebec’s shortage of power would put our negotiating team in the driver’s seat during negotiations on the Lower Churchill. With such obvious negotiating power, Mr. Speaker, could the Premier please tell the people why he did not use the Lower Churchill as a bargaining lever to address the inequities of the Upper Churchill contract? Would the Premier explain why he quit on the objective of every single Government of Newfoundland and Labrador since the deal was signed over thirty years ago? Mr. Premier, you might be prepared to quit on the Upper Churchill but the people on this side of House (inaudible) are certainly not prepared (inaudible). My question for the Premier: If the Premier is prepared to give up on the Upper Churchill and allow this lopsided agreement to continue for another forty years, what does that say about this Premier and this government and their view of our place in Canada? Are they quitters or are they merely trying to secure their political future rather than securing the best interest in the future of the children of this Province? Mr. Speaker, yesterday, as a result of questions, four matters were confirmed: One, that there is no redress on the Upper Churchill, that the Premier and his government have quit on us and have quit on this issue. I say to the Premier, Mr. Speaker, and I quote the words of the chairman of his task force on our place in Canada, that it would be a sad day for this Province if there is no redress on the Upper Churchill. Mr. Speaker, let me ask the Premier a very, very straightforward question: Premier, with regard to the Lower Churchill deal, do you support moving forward on a deal with Quebec without first seeking a better deal on the Upper Churchill? I do not want to put words in the mouth of the hon. the Premier so I will ask the Premier again a very straightforward question: With regard to the Lower Churchill deal, do you support moving forward on a deal with Quebec without first seeking a better deal on the Upper Churchill? Yes or no, Premier? That is all I want. Mr. Speaker, a reread of Hansard will indicate that the Premier has said he does not support what Mr. Peckford did, so therefore his answer is yes, he would proceed with a deal on the Lower Churchill without seeking any redress or a better deal on the Upper Churchill. All that was mostly dancing around the edge. The member raised the questions, cast the aspersions, and was pleased with himself for doing so, but assiduously avoided committing himself to anything. At least inside the chamber. Two million dollars (a day) — $60 million a month, that’s what we’re losing on the Upper Churchill and (the government is) telling us we’re living in the past. Well, there’s 39 more years of that that we got to live with. Our position here tonight ... is that there should be no deal on the Lower Churchill until there’s redress on the Upper Churchill. Or, at least, it was, less than seven years ago. But times, apparently, they change. The Premier has gone to Quebec, and gone to Premier Charest, and, y’know, we’ve had Nalco(r) visit, y’know, Hydro-Quebec, I’ve been meeting with ministers and so on, and we say to them, OK, y’know, we’ll set the Upper Churchill to one side. But, y’know, let’s sit down and have a talk about this Lower Churchill piece. Roger Grimes would be rolling in his grave, if he had one: the people on this side of House (inaudible) are now, it would seem, prepared (inaudible). Over the course of the summer, a guerilla marketing campaign of sorts has had the Grand Falls-Windsor area buzzing. 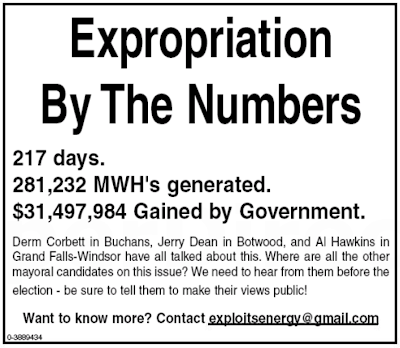 A really clever series of simple display ads in the Advertiser has made factual claims, and asked provocative questions, about Our Dear Expropriation of the power assets of the town's former paper operation. For the benefit of those who don't live in the Advertiser's cachement area, here are scans of some of the ads which have been bought so far. Back in 2007, Danny Williams announced, with some fanfare, the signing of a not-overly relevant piece of paper involving Rhode Island. Then, all of a sudden, nothing happened. For two years. Transmission access requests have been filed with Quebec and New Brunswick as an exit point into Ontario, the Maritimes and the northeast U.S. Nalcor Energy has also entered into discussions with Emera and Nova Scotia Power to study the subsea link and access to northeast U.S. markets. A full environmental assessment process has started for the generation portion of the Lower Churchill project. Appropriate consultations continue to take place with Aboriginal groups and discussions are proceeding with the Innu Nation on an Impacts and Benefits Agreement. MS JONES: Mr. Speaker, I have a couple of questions today to follow up on the Lower Churchill piece that we were asking about and debating yesterday in the House. Government has touted the State of Rhode Island as a potential market for Lower Churchill power. In fact, they announced and signed an MOU with them June 27, 2007, with a great deal of fanfare at that time. I have a copy of the MOU, and I actually accessed it through the State of Rhode Island government, not through the open, accountable government they claim to be in the Province. Mr. Speaker, two years ago they agreed to conduct a joint assessment for a long-term sale and purchase agreement of Lower Churchill power. I ask the minister today: Has this ever been completed and, if so, can you table it in the House of Assembly? MS DUNDERDALE: In June 2007 we did, indeed, enter an MOU with Rhode Island, and during that time it was agreed that we would study the possibility of us wheeling power and selling power to the State of Rhode Island. We did the work, Mr. Speaker; Rhode Island did the work. They found out that they did not have the capacity to negotiate a long-term power purchase agreement with Nalcor on behalf of the Province. Nor were they able, in their Legislature, to do the regulatory changes that were required in order to wheel electricity into the state. Therefore, Mr. Speaker, we learned a lot through that discussion but it was not possible and we have moved on because other customers are in a position to be able to do business with Newfoundland and Labrador. MS JONES: When they signed the MOU with the State of Rhode Island, there was a big press conference and there was a whole lot of fanfare, but it took us two years to find out that it came to nothing, absolutely nothing. Maybe the minister can stand and tell me today what markets or what customers are you looking to secure power purchase agreements with, that have the capacity to be able to negotiate with Nalcor on Lower Churchill power. MS DUNDERDALE: Potential markets exist for us in Labrador, on the Island of Newfoundland, in Ontario, through the New England States, and New York. Yes, Mr. Speaker, it is absolutely possible to wheel power through and sell power. Mr. Speaker, we are doing it today. For the first time in the history of Newfoundland and Labrador, we are wheeling power through Quebec from border to border, and we are able to do that because of the Open Access Transmission Tariff. 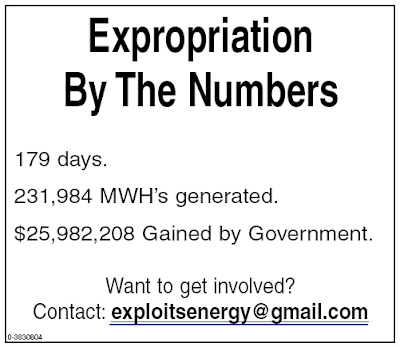 We are selling power into the United States, so it is possible. That is why we have OATT. 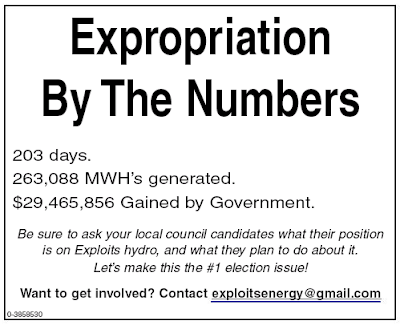 Provinces are doing it through the country; utilities are doing it through the country. It is entirely possible. Incidentally, isn't it amazing how, in Ms. Blunderdale's physics, it is simultanously possible and impossible to wheel power through Quebec? The great of the land gathered here today to pay their final respects to Premier Maurice Duplessis. The funeral was the biggest Trois-Rivieres has ever seen. The provincial government alone reserved 800 of the 1,200 seats in the Trois-Rivieres cathedral. Following the services the cortege wound to St. Louis cemetery, on a hill overlooking Trois-Rivieres, the premier's home town and favourite city. Duplessis died three days earlier in the Iron Ore Company chalet at Schefferville, a stone's throw from the Labrador border. A legend had grown up, which Duplessis did nothing to dispel, that he once urinated across the line to express his opinion of the 1927 Privy Council decision — although another legend has it that M. Duplessis may have had certain anatomical difficulties in performing such a show of contempt. Anyway, Duplessis is dead and buried. At least, it is in Quebec. This is a great national project. It’d provide work and provide power for at least four provinces, and also a lot of the fabrication work [mumblemumble] come out of Quebec and come out of Ontario. One day in December, 2002, the same fellow who scrummed today after speaking to the St. John’s Bored of Trade was on the offensive. Mr. Speaker, even more information came from the meeting in Labrador which the Premier held. Would the Premier confirm that he told that private meeting that the prefabrication of the turbines and powerhouse components would be done by Quebec companies, in Quebec? Mr. Speaker, last month, in his economic plan for the next three years, called Horizon 2005, Premier Landry of Quebec said his government is concentrating on an agreement with Newfoundland and Labrador concerning the development of Gull Island which could lead to the creation of numerous jobs and numerous business opportunities for Quebecers. That is the contrast with our Premier. Mr. Speaker, I ask the Premier: Why are we entering into an agreement to create numerous jobs and opportunities for Quebecers and only fifty long-term jobs for Newfoundlanders and Labradorians? Once upon a time – that is, less than seven years ago – Lower-Churchill-related fabrication jobs in Quebec was a vice. Then, it was a sellout. Now, it’s a selling point by a salesman who has more than a hint of desperation in his voice. Somewhere, Roger Grimes is rolling his eyes. It's like the scrum that keeps on giving! I promoted ATIP, I promoted Access to Information when I was in opposition coz I felt it was worthwhile. What I've seen from the other side of the fence is some of the requests that we get for access to information are UNbelievable. Like, every speech I've ever given since I got into politics, that's ten years of speeches. So fine [mumble] staff will dig that out. Then they start to dig into more information. My staff at the Eighth Floor could spend all their time just digging out and trying to answer ATIP requests. Things that are important, things that are fundamental and that the public need to know we get that for them. But some of the requests that come in are ludicrous, they're ridiculous, they're just people who are looking for an edge, people who are trying to find something that they can hang their hat on, but, y'know, there's no hidden agenda here. This is not about trying to be secretive or private. There's just so much a government can handle, there's only so much we can do and still run the province at the same time. Invoking the NOT(X) = X formula, a logician yields an interesting result when it's applied to the pronouncement that "this is not about trying to be secretive or private". You can now add "ludicrous" and "ridiculous" to Himself's list of favourite latinate adjectives to describe Access to Information Requests that We Don't Like. The previous adjective of choice having been, of course, "frivolous". But you see, here's a strange thing. Nowhere in the governing legislation, nor in the associated regulations, will you find the words "ludicrous", "ridiculous", or "frivolous". You will certainly find nothing which gives a respondent department, like, say, the Premier's own, Executive Council, any power to determine that a request is "ludicrous", "ridiculous", or "frivolous" and ignore it accordingly. (You will also not find the magic phrase, "non-responsive".) And you will not find any exculpatory provisions about what a government can handle or how much a government can do. Requesters request. Respondents respond. The end. Unless the Commissioner has to investigate. The end. Well, unless the courts get involved. The end. And the strangest thing of all? That would be, to ponder the question of why the Premier himself takes such a close and fascinating interest in the content of Access to Information requests, to the point where he can throw out the specific example of the content of an ATI request like that. Really, isn't there only so much a Premier can handle? only so much a Premier can do and still run the province at the same time? To the Premier's credit, he does indicate in his scrum that his staff will release the speeches that are the subject of the example request. However, his talk about "the other side of the fence" makes it clear that he is acutely aware of his own — how to put this? — evolution on the issue of access to information. Just how far has he evolved? Mr. Speaker, the Premier has claimed to have an open, accessible and transparent government, yet the new Freedom of Information Act, the proposed Bill 49, in fact makes it more difficult for the public to secure information due to procedural roadblocks. Could the Premier explain to the people of Newfoundland and Labrador why the former act had a thirty-day response period, yet the new act, the proposed bill, requires reasonable efforts only in a thirty-day period, provides for an extension of a further thirty-day period under certain circumstances and, in fact, provides for circumstances where it can be in excess of ninety days? Could the Premier please explain why the differences? ...I quoted Abraham Lincoln, he said: "Let the people know the truth and the country is safe. We will keep the people of this Province fully informed; there will be no secret documents, there will be no hidden agenda. If you and I know the facts then we will collectively decide the best course for our future.." of this Province. That is what I said at that time, and a week later the committee was struck to review the Freedom of Information Act. I am glad that you took that initiative. ...last year, if I remember correctly, there was an incident where a member of the Opposition made an application for some information under Freedom of Information and a bill of $10,000 was proposed. The hon. the Leader of the Opposition. A $10,000 bill was put forward to try and block the information. A lot of money. Now, let’s deal with time periods because I think it is important to track what the ordinary individual is going to have to go through in order to get information from this government or public body or any of the people under the definitions. The former act said it took thirty days. In thirty days the information had to be provided. The new act says, reasonable efforts within thirty days. Now, Mr. Speaker, my submission is: Who decides what reasonable efforts are? So, if you can’t do it in thirty days with a reasonable effort, what is a reasonable effort: 365 days, 720 days, 31 days? Who defines that? Completely subjective. ... information about negotiations carried on by or for a public body for the government of this Province. That is the Voisey’s Bay clause. That is the Lower Churchill clause. That is the one that this government can use to prevent disclosure of negotiations. Their answer to that is: Well, you cannot disclose the negotiations. If negotiations are going on in private, it is not right to get out and disclose those negotiations. You cannot do that. Well I submit, Mr. Speaker, we should do that. The people of this Province have a right to know what is going on. It should not be done behind closed doors. It should not be a fait accompli. It should not be signed, sealed and delivered and then rammed down their throats after it is all over. That is too late. That is wrong. It is these kinds of clauses that are dangerous to the public. Access to information is extremely important, but denial of the right to know what is going on in those negotiations affects our future and affects the future of the children of this Province. If those resources are given away, forever and a day, when hon. members opposite are long gone, who pays the price? It will not be any of us in this House. It will be our children and it will be our grandchildren. They are the ones who are going to pay the price when it is all over. Why are he and his government using this very, very important piece of legislation to deny vital information to the people of Newfoundland and Labrador? What are you trying to hide? Of course, that was then, and this is now. Not only does He have the benefit of seeing things from the nicer side of the fence, the two situations are nothing alike. The government he was opposing was, allegedly, using the legislation to deny access to information. His government doesn't even deign to invoke the legislation to do the same, and more. PS: Special greetings to the Access to Information officials from across Canada who are meeting this week in Dannystan. Be sure to buy something nice for your office staff back home: after all there are only 18 shopping days till Right to Know Week. You think it's easy to make priorities? In order of most to least important, where 1 is the most important, and 5 is the least important, please rank the follow areas in order of importance for consideration in a long-term city vision. Nearly a third of the respondent candidates — Art Puddister, Ron Ellsworth, Dennis O'Keefe, Shannie Duff, Bernard Davis — ranked all five areas as "1". Other funnies in the survey report are the twelve of sixteen who consider ten years or less to be "long-term", as in "long-term planning". These include Ron Ellsworth ("five to seven years") and Tom Hann ("5"). Whatever gets you through the next election. If they don’t come on side, then we’ll do it without Quebec, and we’ll do it without the government of Canada. But that’s not the way a country should operate. Quebec should be working with us, the government of Canada should be working with us. A body might be forgiven for thinking, lo these past four years, that Himself was determined to “go it alone” on what He has taken to calling “the Churchill”. Mr. Speaker, in anticipation of this announcement today, I spoke last night with the Prime Minister to indicate to him that this was proceeding and exactly what we were doing. I spoke to the Premier of Ontario, Dalton McGuinty, to indicate that we were proceeding on a go-alone basis but that we would certainly be prepared to entertain the Province of Ontario as a customer. I spoke to the Premier of Quebec, Jean Charest, and talked to him about what our plans were. We discussed briefly his energy proposals, which were released just last Friday. He indicated to us that they had gone ahead with their energy plans on the basis that - they assumed that we were probably going to do the Lower Churchill project on our own. Yet now Himself is fustigating and fomenting froth against Quebec and Canada for not participating in his little go-it-alone adventure. And herself, Minister Blunderdale, expressed frustration last week on VOCM that Quebec wouldn’t take an equity stake in the Churchill. That is, a piece of ownership. You would think that, in ratcheting up the language of “go it alone”, that that is exactly what He, and We, wanted. He doesn’t want to go it alone. He never wanted to go it alone. As Minister Blunderdale told VOCM on Friday, “we’ve got a path beaten to their door.” The They in question being Hydro-Quebec. When it comes to the involvement of Quebec and Canada, what He, and consequently We, want, and now have always wanted, is to go it alone – together. Come to think of it, it would make a great slogan for a slick promotional campaign. The Churchill: Going It Alone – Together. Here’s the full video. The money quotes are about a minute in. So he was just kidding about "just kidding"
Danny Williams. Rhodes scholar. Inventor. Behold, good people, the moment in which the Great Man invents... meta-kidding, in which you are just kidding about kidding. So, if he was kidding about kidding about building a power line through Gros Morne... does that mean that the Gros Morne plan is back on? MS JONES: Government’s latest shift in position on the Lower Churchill has been to announce that Gros Morne is officially off the table as a transmission route, and this was after the Premier and his government had adamantly defended this route as being $100 million cheaper, money that they would have rather seen invested in health care, I think were the comments that were made, but them a few days ago the government said: We are just kidding. Mr. Speaker, kidding about causing permanent damage to a UNESCO World Heritage Site was an unbelievable statement for me to hear, but my question to the Premier today is: How serious are you about a north-south grid of power for the Lower Churchill Project, or is that just another joke that is being proposed by the government? PREMIER WILLIAMS: The first thing you should do is lighten up. You must have had a bad summer; there must be something going on. I saw you yawning over there a minute ago when the House Leader there was speaking. Anyway, that was a very light comment that was made in the course of a speech. It was said jokingly, and it was received that way, and I would say it again. MR. TAYLOR: In February, I was pleased to join Premier Williams to announce $800 million in strategic infrastructure investments in this fiscal year alone. I would hope, quite frankly, that if all things go well, that by the end of this year we should be in a position to possibly announce a deal on the Lower Churchill. 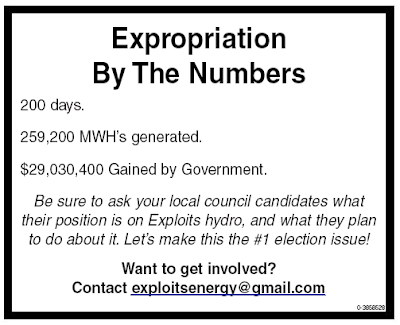 We are working towards a project sanction in 2009 and first power in 2015. Under the leadership of My Premier, who is chair of both the Council of the Federation and its Energy Committee, Newfoundland and Labrador is currently working with other provinces and territories to produce a Pan-Canadian Energy Strategy. 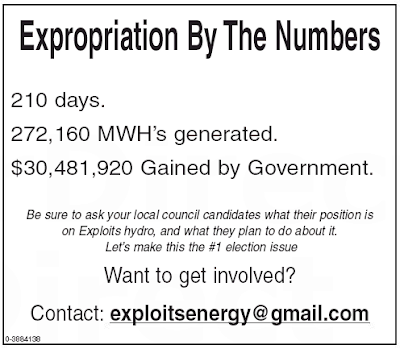 Newfoundland and Labrador Hydro already developed, on My Government’s behalf, a comprehensive Lower Churchill project execution plan to achieve a project sanction date by 2009 and first power by 2015. You will see the development of the Lower Churchill in our lifetime, and long before that, for the benefit of the people of Newfoundland and Labrador. You will see the development of the Lower Churchill before the sun expands into its red-giant phase and vapourizes the earth, and long before that, for the benefit of the people of Newfoundland and Labrador. You will see the development of the Lower Churchill before the heat death of the universe, and long before that, for the benefit of the people of Newfoundland and Labrador.